In an industry steeped in tradition, thinking outside the box is starting to pay off for this small local brewery. Given the ubiquity of sake (or nihonshu as it also known) in everyday Japan, one could be forgiven for thinking of sake brewing as a thriving industry. However, the reality is not so simple. While slumping sales of low-end table sake (think the stuff in packs you see in the supermarket) produced in high volume is dragging overall numbers down, premium sake consumption is on the rise. (Premium sake, in this case, being sake that has met the industry criteria for the production process and the omission of secondary ingredients, leaving the basic ingredients of rice, water, yeast, koji mold and occasionally, additions of distilled alcohol). Consumers, both local and abroad, are enthusiastically coming around to the complex and variant flavor profiles that premium sake offers. This is both an exciting and confusing time for Japan’s 1,300 or so breweries. Some have embraced this new era by diving into the foreign market, sending export volumes soaring over the last 5 to 10 years. Other breweries have successfully tapped into the local youth market with colorful rebranding, hip marketing strategies, and engaging social-media profiles. Then are those that are floundering with a customer base of aging drinkers, an outdated website, and no idea how to attract new customers. This reality is what sadly sees at least a couple of breweries go under each year, which is why it is always heartening to see a brewery turn it all around and come back from the brink. Situated in a valley at the foot of the Ikoma mountain range in Katano City, Osaka sits Daimon Brewery, established in 1826. This location offers access to locally grown rice and soft, pristine water that flows from the surrounding mountains; an ideal environment for sake brewing. Their premium Daimon series range. The numbers indicate the polishing ratio. Yasutaka Daimon, the current and sixth-generation president, is a suave gent, spritely for his 70 years, and surprisingly fluent in English. As the oldest of four children, his future with the brewery was never in doubt but before committing to the family business, he chose to spread his wings with an extended ‘gap year’ traveling to 65 countries over six years from 1969 to 1975. It was through these travels that Daimon learned English (and some French) and developed his affinity for international culture. Upon his return to Osaka, Daimon joined the brewery, working his way through various administrative and sales roles before studying the art of brewing. Daimon Brewery enjoyed relative success over the following decades. In the nineties, he began to concentrate on small-batch production: artisanal sake rich in umami (savory taste) to complement the food of Kansai. Later, he was one of the first breweries to take on a non-Japanese brewer and also co-founded the Japan Sake Export Association. Despite these successes, Daimon Brewery was not immune to the industry-wide issue of aging staff. With little interest from young prospective employees, Daimon himself stepped into the role of toji (head brewer) around 2003. But after several years, financial realities and staffing issues weighed heavily to the point where he began to question the future of the brewery. The head brewer (Toji), Ryosuke Uei, oversees production. Here seen preparing rice for steaming. It was during this period of uncertainty that Daimon had a chance encounter with New Yorker Marcus Consolini who was in Kyoto on a machiya (traditional wooden Japanese house) renovation project. Marcus’ career background in finance and banking along with his 25-year love affair with Japan’s culture, martial arts, and of course—sake, proved to be the key to bringing Daimon Brewery back to life. In 2017, Daimon took a step that was unprecedented in the sake industry—it appointed a foreigner as the new CEO of Daimon Brewery. As CEO, Marcus’ sharp business acumen and assertiveness juxtapose nicely with Daimon’s laid-back, old-school approach. In the short time since Marcus’ appointment, brewery staff has increased from two to six, a business staff of one has increased to a multi-lingual, international business and sales staff of 10. Even Daimon’s sons, who were initially encouraged to look to other career paths, have joined the family business. Together, under this new dynamic, Daimon and Marcus are striving to re-establish Daimon Brewery and their flagship label Rikyubai in the sake scene, first locally then globally. 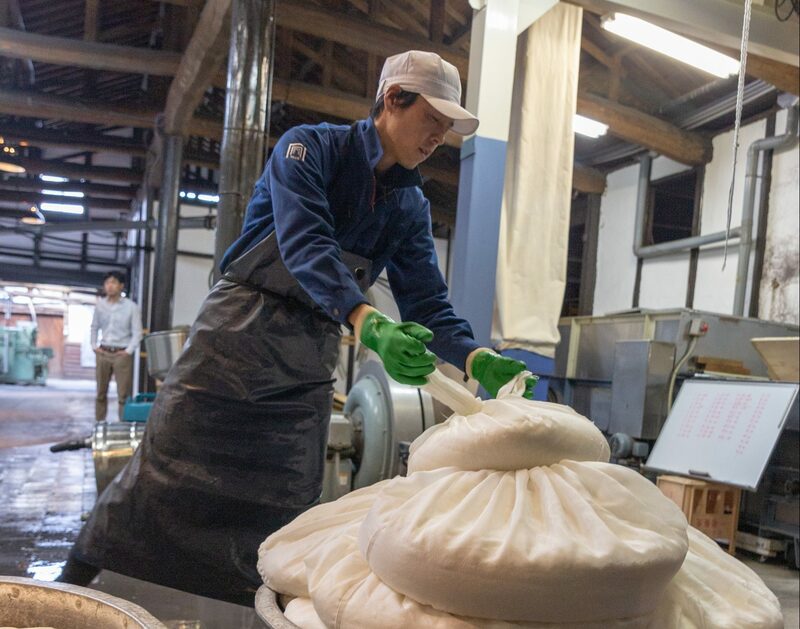 As part of their dedication to letting the world know about Osaka sake, Daimon Brewery is also offering the unique opportunity of brewing internships. Living onsite at the brewery for one week, an intern can gain hands-on experience in every facet of sake brewing, all explained in English. Anyone interested can contact the brewery directly for details. If you are eager to try the sake of Daimon Brewery, go straight to the source and join a brewery tour, happening Thursday and Friday afternoons from 3pm for ¥1,500. During the tour, you can see step-by-step how the sake is made with an English-speaking guide and do some sake sampling at the end. Alternative times may be arranged by contacting the brewery directly. If you want to settle in for a meal, the onsite brewery restaurant Mukune Tei was re-launched this year after a four-year hiatus. Offering hearty, home-style cooking and a cozy, Japanese homestead feel, Mukune Tei is a comfortable spot for getting acquainted with the Daimon Brewery ethos. Friday nights are sake nights with a buffet dinner, all-you-can-drink sake, and occasional live music. Saturdays are open for lunch and dinner and Sundays lunch only. (If you’ve had your fill of sake, head downstairs to Marcus’ private whiskey room for some drams and a cigar!). Keep an eye out in the New Year when the restaurant will welcome some international chefs for guest stints in the kitchen. Following the success of their Fresh Pressed festival in November, April will bring their next open-brewery festival with lots of sake, music, food and good vibes. Sample sakes or take a self-guided tour at gekkeikan in fushimi, kyoto. If you’re exploring another part of Kansai and are eager to visit a sake brewery, here are some easily accessible options. A wander around the sake town of Fushimi will bring you to sake behemoth Gekkeikan. Here you can see all manner of sake brewing artifacts with explanations in their Okura Sake Museum. Also, sample sake in their tasting room open from 9am–4:30pm weekdays and 11am–3pm on the second Saturday of each month. Self-guided tours offer a peek into the brewing process for ¥400 from 9am–3pm daily. The Nada region in Kobe is the largest and arguably most famous sake-producing region in Japan. There are plenty of breweries offering tours in the area, but Kiku Masamune offers something a little different with its preference for utilizing older production methods and maturing sake in cedar barrels. Check out the museum daily from 9:30am to 4:30pm, or book online for a free guided tour and tasting of their range. Available times and dates are on the website. On the way out to picturesque Shirahama, Nakano BC in Kainan City offers an informative appointment-only tour of its facilities and immaculately maintained gardens. Here, you can also see the brewing process up close, try some of the sake in their range, and, if you are so inclined, purchase a few bottles to take home.